Mix together all ingredients, except olive oil and bread crumbs. Shape into equal size cakes and coat with bread crumbs. In medium skillet, heat oil over medium high heat. 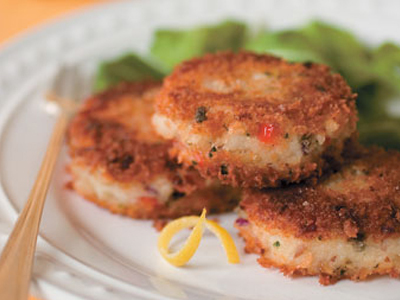 Cook catfish cakes 2 minutes on each side. Transfer catfish cakes to greased baking sheet; bake in oven 15 minutes. Remove catfish cakes from oven and place on serving dish. Garnish with Lemon Caper Sauce and fresh lemon wedges.